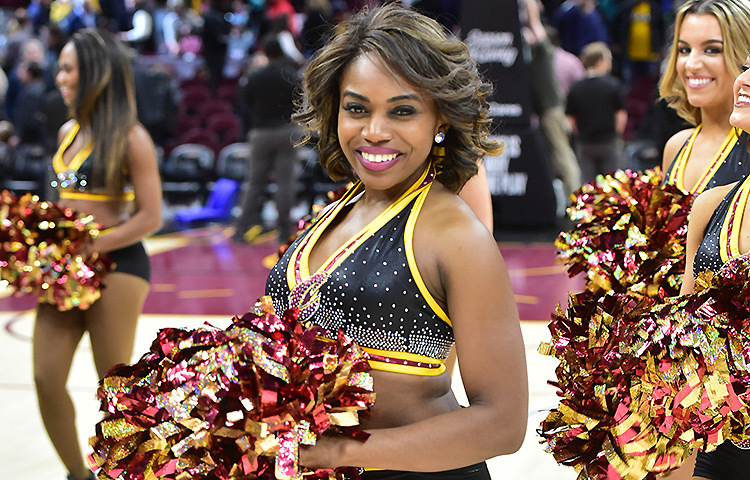 The Cleveland Cavalier Girls are featured in this week’s Sports Illustrated NBA dance team gallery. Click here to view the game day action. Rookie Ashley’s Exciting First Season!! What an awesome experience this has been for me joining the Cavaliers family during such a victorious season! The exhilarating energy from the fans in the arena has made the games so exciting for me. Every time I step into the arena, I still get the same chills and excitement I felt when I made my debut on opening night. The entire game presentation and crazy devoted fans are what truly makes the experience of a Cavs game so thrilling! My season actually began the end of June when I received a phone call at work that I was one of 16 girls to make the team. I was working on the sales floor and somehow hid my cell phone in my pencil skirt waiting for my phone call. When I saw Jami was calling, I hurried up and ran outside to answer. Of course, knowing Jami, she played a trick on all of us by making it seem like we were not chosen for the team. But shortly after, she turned our almost tears around to a “Congratulations, you are a member of the 08-09 Cavalier Girls!” I can’t even describe to you the feeling I experienced from the phone call that day. Let me tell you, it’s not as easy as it may seem to be a member of this team. It takes a ton of heart, talent, hard work and dedication. That line of congratulations that day meant so much more to me than just a spot on this team; it meant that I truly have accomplished and deserved my dream. Knowing that I am standing where I am today based on these ambitions is such a rewarding experience for me. 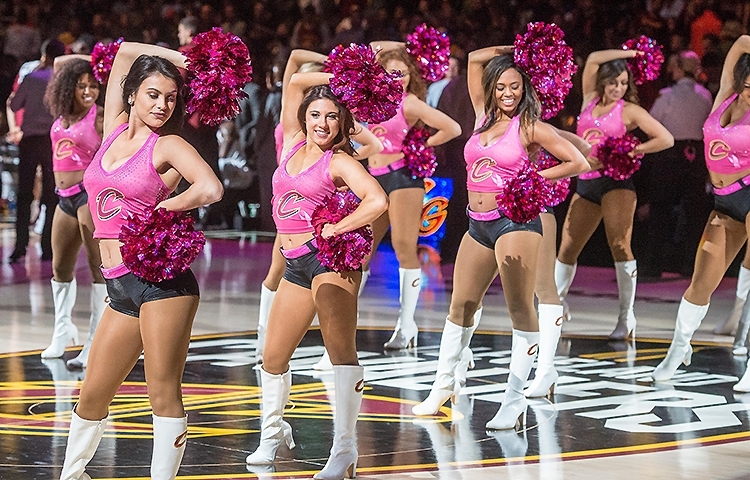 But most of all, being able to stand amongst and learn from one of the most beautiful, deserving and talented dance teams in the NBA is even more rewarding. Speaking of rewarding experiences, seeing my picture revealed as Miss December 2009 in the annual Cavalier Girls Swimsuit Calendar was such a breathtaking moment. It took a moment to realize that it was actually me in that photograph. I definitely had to pinch myself a little to make sure I wasn’t dreaming haha! We trained very hard at the beginning of our season to work towards this calendar, and went through a pretty long and tiring day of shooting with no idea of how our pictures turned out. On the night of our calendar release party, Jami planned it so that we thought we were just dressing up to go out to a team dinner. She took us to the first floor of the Q, and as soon as we got off the elevator we were shocked to see our families standing there in front of us. I was so surprised!!!!! I immediately starting crying upon seeing my parents faces. Once inside, they revealed our calendar pictures one at a time and everyone was so shocked and thrilled with how stunning their picture turned out. The calendar is absolutely beautiful and very classy while still most importantly, representing for the Cavaliers! Most of all, the games thus far this season have been incredible! Every member on the basketball team seems to be such a good fit and great force to lead us to the Championship this year! It’s crazy to think that just last year I was also a huge fan sitting up in Loudville cheering on the Cavs. Now, I’m still a huge fan, but I get to sit on the court cheering a few feet away from the players or dancing center court in front of the entire arena. Being able to dance and entertain every game in front of such enthusiastic fans is the most exhilarating moment of my life! 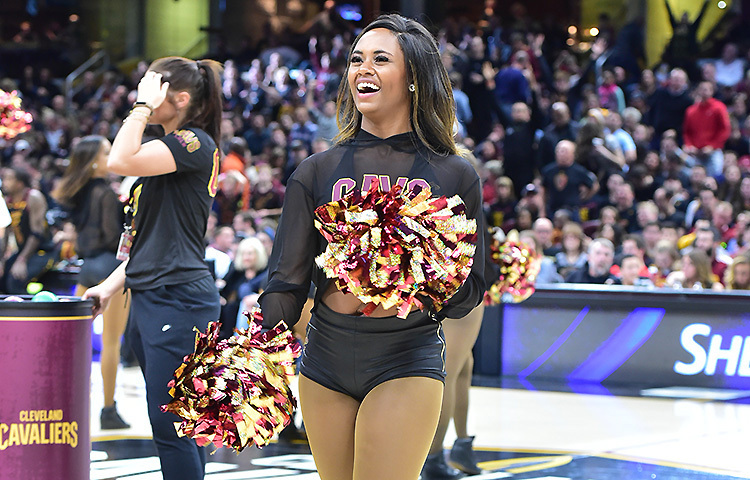 What could possibly be better than the opportunity to do what you love in the presence of the best fans in the NBA, while cheering on the best team in the NBA….nothing! J Keep it up fans, YOU are what keeps this Cavalier family strong!